HAVE YOU EVER HEARD OF THE SHINOHARA INTENSITY RATIO INDICATOR? These are indicators that IQ Option clients often use and are most accustomed to. Examples are Bollinger Bands, RSI, the stochastic oscillator, common moving averages, etc. The new momentum indicators are: Aroon Oscillator, Balance of Power, Center of Gravity, Klinger Oscillator, True Strength Index, Williams’ Percent Range, and Woodies CCI. Volatility indicators can be really handy for various reasons. For example, the ATR (average true range) indicator can help traders to match their stop loss and take profit orders with the current market volatility. 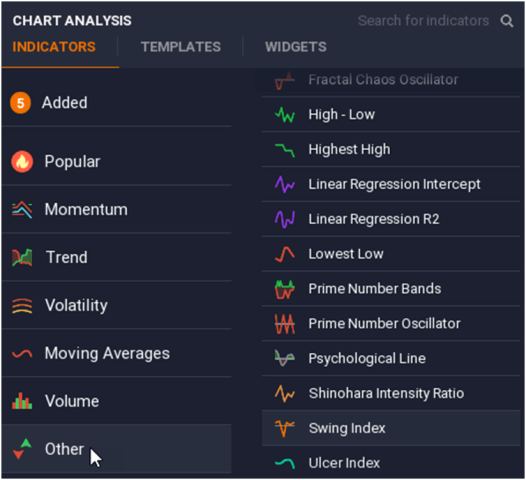 IQ Option’s new volatility indicators are: Average True Range, Chaikin Volatility, and Donchian Channels. The trend is your friend! But what are the different tools you can use to identify trend direction and strength? IQ Option has no less than 24 trend indicators, which includes these new ones: Aroon, Mass Index, and McGinley Dynamic. Moving averages are widely used by all types of traders, investors, and money managers. You may be familiar with simple and exponential moving averages, but there are quite a few more to choose from. The new moving averages in IQ Option’s arsenal are Arnaud Legoux Moving Average, Kaufman’s Adaptive Moving Average, Least Squares Moving Average, and Rainbow Moving Average. Trading volume is an extremely important indicator that can be used to confirm trends and anticipate reversals. The new volume indicators are: Net Volume, Volume Oscillator and Weis Wave Volume. This group contains 20 interesting indicators that are worth checking out. The new indicators in this section are: Chande Kroll Stop and Coppock Curve. IQ Option clients now have an impressive range of more than 70 technical indicators to choose from!